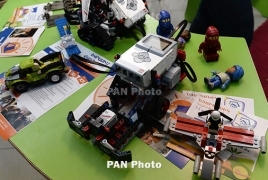 PanARMENIAN.Net - The 14th annual DigiTec technology exhibition wrapped in Yerevan after featuring a number of services for B2B, B2C, B2G, as well as innovative education opportunities and a series of seminars. DigiTec 2018 united up to 120 IT companies and projects and hosted about 80k visitors. This year, the exhibition also boosted the effectiveness of establishing business ties. Held under the slogan “Fest for Technological Armenians”, DigiTec is the biggest and most anticipated event in the region. This year, in honor of the Francophonie Summit held in Yerevan, DigiTec has been extended for one day so that the guests and representatives of the economic forum get acquainted with the technological and innovative solutions of local and international companies represented at DigiTec. The French engineer and scientist, the inventor of the datagrams and founder of the CYCLADES network Louis Pouzin was also among the delegation. He confessed that he was impressed by the work of Armenian companies, in particular he was pleasantly surprised by the vision of Armenian companies about the future and the aspiration to walk the world alike. Guests of the exhibition were particularly surprised by the creative thinking of Armenian schoolchildren. Within the framework of DigiTec 2018 which also bears the slogan “On the way to World Congress on IT (WCIT)”, the official countdown of the WCIT 2019 was launched. It will be held in Armenia, at the Karen Demirchyan Sport and Concert Complex on October 6-9, 2019. About 2000 delegates from ICT and business sector from all over the world will arrive in Yerevan to participate at WCIT 2019. DigiTec Expo has been held since 2005.